Todd Fryhover: The weather’s been absolutely perfect on the 2018 crop. You know, we had very little damage through the Winter. Our frost season didn’t really exist, so to speak. There was you know a hail storm here and there, which is actually kind of normal for our industry. So, we’re looking at a good quality crop for 2018. TF: I think the sizing will be improved over last year just because we did have smaller sizing. So, we’re very optimistic on the fruit quality, but also the varietal diversification as well. TF: From the information that I have, which comes from Proprietary Variety Management, it looks like 2019 is the first year that we have any real commercial volume. We’re looking at 200,000 equivalent cartons available in 2019, but I’m there will be a very limited availability in 2018. BL: But, Fryhover says if you get a chance to buy Cosmic Crisp, grab some because they’re delicious and store terrifically. The whole process takes as long as 20 years. Both varieties are tart, crisp and juicy and typically generate excitement when the university passes the apples out with survey forms at trade shows and conferences. Still, their future is far from certain. “There’s no guarantee that either of them will make it,” Evans said. But if she has her way, there will be more new apples right behind them. Bruce Barritt wanted to create a new apple variety. This is how he tasted his way to the Cosmic Crisp. Back in 1988, Red Delicious made up 70 to 80 percent of the domestic apple market. Over the years, farmers sold a lot of them because they looked great. But they had a mealy texture, and people want an apple that’s firm, crisp, and juicy. I started lobbying for one. By 1994, threatened by varieties from Japan and New Zealand, the U.S. industry and Washington State University agreed that we had to grow our own. First, we cross-pollinated existing apples: Collect pollen from one flower, put it on the tip of a pencil eraser, and rub it into another. We crossed dozens of crisp, flavorful varieties such as Gala, Fuji, and Pink Lady. But the best offspring came out of Honeycrisp and Enterprise parents. We grew the crossbred seeds into 5-foot trees, grafted those onto rootstocks (to make them start producing quickly), and planted them in evaluation orchards. A few years later, they fruited—and we began tasting. You can’t eat thousands of apples a day. So I would walk down long rows of hundreds and thousands of trees, and when I found an ­attractive fruit, I’d bite, chew, spit it out. Most were terrible, but when I found one with good texture and flavor, I’d pick 10 or 20 of them. Then I put them in cold storage to see how they would hold up after a few months. After that, three or four researchers sat down and tasted every apple. We checked acidity and sugar levels, which can break down over time, and tested firmness and crispness using instruments that measure pressure and cell breakdown. When we found exactly what we wanted, we planted clones and tested them all over again. Eventually, we ended up with the Cosmic Crisp. It can spend nine to 12 months in storage, and stay crisp, firm, juicy, sweet, and tart. Cosmic Crisp, a cross between a Honeycrisp and Enterprise, was bred by a team at the Washington State University Tree Fruit Research and Extension Center in Wenatchee. The breeding happened in 1997, followed by research to test how best to grow it and then name it. Its research name was WA-38. WSUassociate professor Kate Evans, who hails from England, has been working on the project since 2008, taking over for Bruce Barritt. The apples, according to researchers, are easy to grow and store and are expected to rival Honeycrisp in terms to price point and demand. Honeycrisp apples sell for $50 to $70 a box. Others sell for about $30 a box. The first 700,000 trees were sold to growers by lottery for planting in 2017. About 5 million are expected to be planted in 2018 and another 5 million in 2019, making it the largest roll-out of a new variety. About 200,000 40-pound boxes are expected to make it to market in 2019, jumping to 1.9 million 2020 and 9 million in 2022. WSU gets royalties on trees sold for planting and on boxes of apples sold. Evans is now working on a dwarfing pear rootstock, that would allow them to be grown on smaller trees, increasing density and allowing more efficient management. The Decision Aid System is an online platform available to growers that mixes the latest research-based information with weather forecasts and their own spray history to help growers make decisions about pest and crop management. 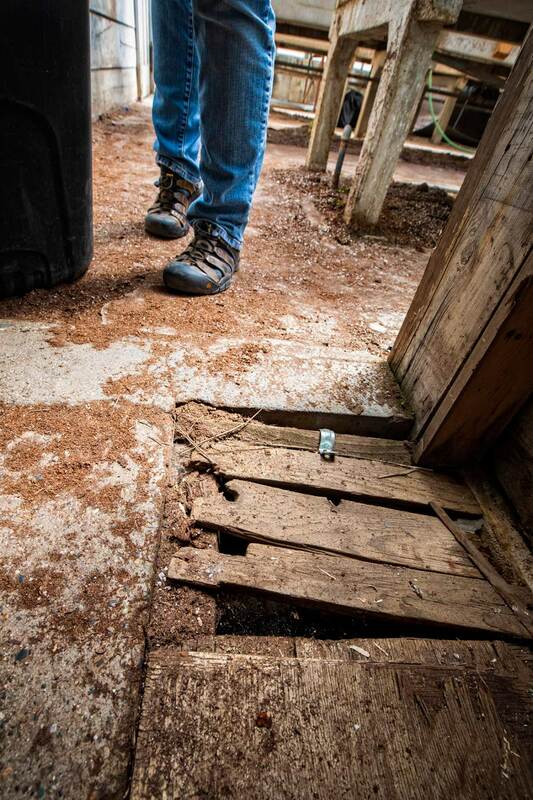 The project is led by Vincent Jones, a WSU entomology professor. In addition to protecting against hail, photo-selective anti-hail nets also protect against plant stress and sunburn. That’s good news for Honeycrisp apples that have a tendency to get burned. The research on the effectiveness of the nets is part of a three-year research project, with trials done at McDougall and Sons orchards. Keeping male codling moths distracted with pheromone-laced tags has become an established practice in pear and apple orchards. It’s just one of the non-spray methods of pest control tested and perfected by WSU researchers in Wenatchee. It was first tested about 25 years ago. Research continues on how to refine the traps. Another technique include spraying a virus that infects the moths. Researchers also are gearing up for invasive pests they know are coming, like the spotted wing drosophila, a fruit fly imported from Asia. “It’s exploded in a lot of the country. It really likes ripe fruit, like cherries or raspberries. So we have a new problem we didn’t have 10 years ago. When something like that pops up, we go into SWATteam mode,” he said, led by WSU Entomologist Elizabeth Beers. Another invader Beers is developing strategies to control is the brown marmorated stink bug. The anticipation for the Cosmic Crisp apple is building, with the first commercial harvest scheduled for 2019. According to Frank Davis, VP of Sales at Washington Fruit & Produce in Yakima, the apple has brought the state together, with partners and competitors alike working together in growing and promoting the apple. Cosmic Crisp has been recognized as a Washington state apple by growers, and as such, they are proud to collaborate in getting this apple onto the market and making it successful. "We are all very excited for the first harvest of Cosmic Crisp in the Fall of 2019," Davis exclaimed. "It has been a great experience working with other orchards, even competitors, together as a state. Initially, there was a lottery system to assign the first orchards to grow them, but now everyone can grow them, if they can find the trees. The industry is in great shape and it's a wonderful time to be part of it." Dennis: The bees were a buzzin this past week as nearly perfect pollination weather was at hand. Yesterday, I talked with Mike Bush, long time WSU extension specialist in Yakima about the apple crop. Mike: Based on the weather forecasts and the weather we’ve had in the past week, there has been a lot of bee activity and anything that is in bloom at this time is going to be well set. Mike: Those growers that are in the post bloom stage have probably already put out their mating disruption ties and within a week or two the growers will start putting out their sprays for coddling moth. Mike: Cosmic Crisp, it does have Honey Crisp in its lineage, does have the good unique flavor that Honey Crisp does, except sweeter, it stores well, does not brown quite as fast. Dennis: So be looking for Cosmic Crisp in the next few years. My Thanks to WSU’s Mike Bush. About 1 million more Cosmic Crisp apple trees are being planted this spring than were estimated in December. Some growers worry about oversupply. More Cosmic Crisp apple trees are being planted this spring in Washington state than expected, heightening concerns about possible overproduction. At the Washington State Tree Fruit Association meeting last December, Lynnell Brandt, president of Proprietary Variety Management, estimated Cosmic Crisp plantings at 5.8 million trees for the spring of 2018. The company was hired by Washington State University to help manage commercialization of the new state apple. Now with the 2018 planting season three-fourths done, Brandt said this season’s tally will end at 6.7 million to 6.8 million Cosmic Crisp trees planted. And that accounts for losses reported by some nurseries from trees that died when their bud grafting onto rootstock failed, he said. Willow Drive Nursery, near Ephrata, experienced about 37 percent mortality on its 2018 Cosmic Crisp and other nurseries were probably close to that, said Jim Adams, co-owner of Willow Drive. “We don’t know what caused it. We’re trying to figure it out. Roots grew fine but didn’t transfer to the variety. Buds died,” Adams said. Willow Drive grew 1 million Cosmic Crisp trees for 2018 but will grow 150,000 in 2019 because growers previously ordered fewer Cosmic Crisp and more of proprietary varieties for 2019, he said. Other nurseries will make up for Willow Drive’s decline, and the best guess remains that 5.2 million more Cosmic Crisp will be planted in 2019, Brandt said. A total of 629,000 trees were planted in 2017, the first year of commercial planting, he said. Brandt said he expects plantings to drop to 2 million trees per year in 2020 and beyond. He estimated just under 200,000, 40-pound boxes of Cosmic Crisp will go to grocery stores from the 2019 crop, 2 million for 2020, 6.2 million for 2021, 11.3 million for 2022, 15 million in 2023, 18 million in 2024, 20 million in 2025 and 22 million in 2026. In comparison, Red Delicious peaked at 61.4 million boxes in 1994 and remains No. 1 at about 34 million. It’s taken Gala more than 20 years to reach 33 million and Honeycrisp 10 years to reach 12 million. The fast ramp up of Cosmic Crisp makes a lot of growers nervous, Adams said. “I hear from a lot of growers across the state. There’s a lot of nervousness, reservations about the sheer volume,” he said. Brandt said oversupply will be countered by Cosmic Crisp being a better apple, replacing older strains of Red Delicious, Gala, Fuji, Golden Delicious, Braeburn, Cameo and Jonagold. The industry will work together using social media to directly reach consumers at limited costs, he said. “Because it’s a brand it must have a marketing approach, not just a sales approach. The brand will become of paramount importance,” Brandt said. An industry marketing committee, including five Crisp marketing entities that handle 80 percent or more of the state’s apple marketing, is making progress toward a marketing plan and has “a lot more work to be done over the next couple of years,” Brandt said. Evans Fruit Co. of Cowiche, WA, long known for its Red Delicious apples, has launched a vigorous expansion of varietals, including those favored by export markets. “Every year we evaluate our current acreage, taking into consideration tree health, acreage yield, overall pack-out trend, current product mix and various other factors to determine whether to replant a particular orchard,” Wolter explained. And the excitement surrounding the new varieties is evident, with several factors going into the choices. The upshot is that retailers receive a more uniform display. Jeff Samples, an agronomy consultant with Bleyhl Farm Service, scouts for damage and signs of disease and pests on the branches of Cosmic Crisp apple trees at a trellis training orchards at the Washington State University Irrigated Agricultur Research Extension Center in Prosser, Wash. on Wednesday, May 18, 2016. Washington State University and a Seattle-based company are in litigation about an agreement between the two. Photo by Shawn Gust, Yakima Hearald-Republic. It’s an apple that could upset the cart. Or at least disrupt it a bit. 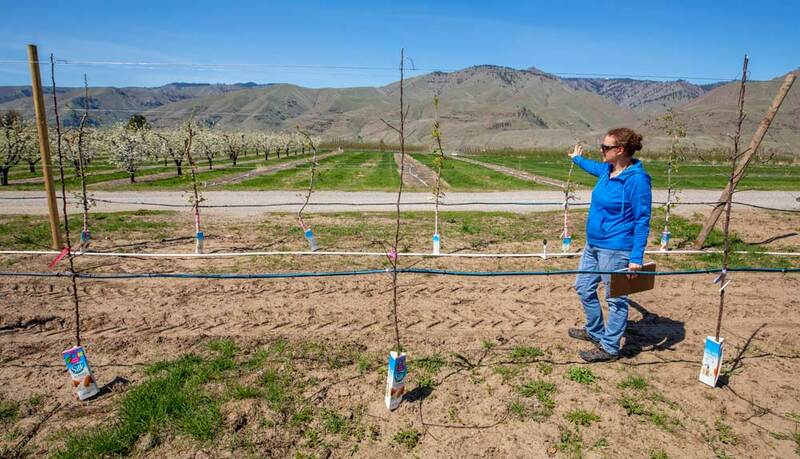 Washington growers are so excited about the Cosmic Crisp’s potential, they already planted a half-million trees and plan to add another 5 million this year. Consumers will have to wait until fall of 2019 before these new apples hit the marketplace. 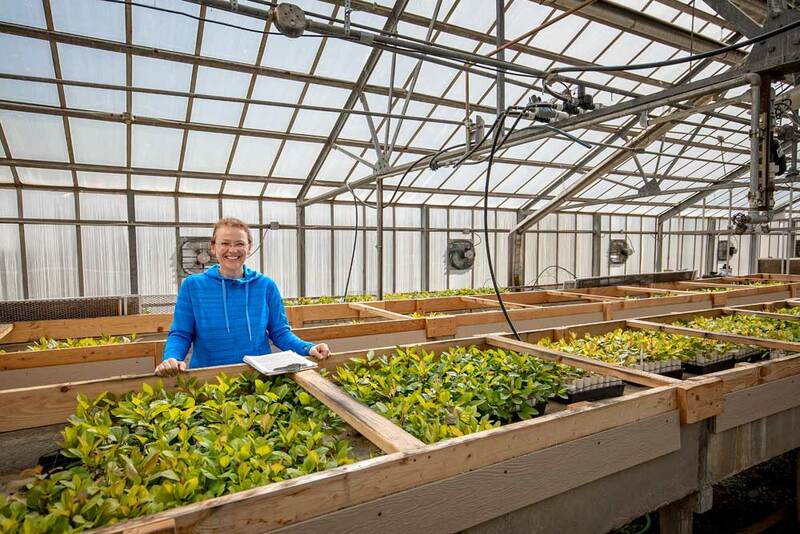 But behind the scenes, there’s a courtroom battle brewing between one of the state’s major universities and a Seattle agricultural technology company over who has the right to sell the trees. But whatever happens, it’s not dampening growers’ enthusiasm for what they see as a game-changing variety of apple. “I’m excited to see how it will disrupt the apple market,” said Mark Hanrahan, a Buena grower who has planted the trees. The story begins in 1998 when Washington State University professor Bruce Barritt crossed the Honey Crisp and Enterprise to create the Cosmic Crisp, named in part for the lenticels on its bright red skin and its crunchy texture. But its qualities are more than skin deep. “It has great flavor, very juicy,” said Phil Weiler, WSU vice president for marketing and communication. “From a retailer’s perspective, it has a great shelf life. It can be stored for a year or more” without losing flavor or texture. Further, Cosmic Crisps don’t quickly turn brown quickly after being cut. The apples could be worth a fortune. Many consumers, long weary of Washington’s once standard Red Delicious, have shown they are willing to pay more for new and better fruits. At one Yakima Valley store, Honey Crisp apples are sold for three times as much as Red Delicious. Growers are expected to produce 175,000 boxes of Cosmic Crisps in 2019, with projected crop yields of 13.5 million boxes in 2023, Brandt said. Hanrahan said Cosmic Crisp represents a coordinated effort between the fruit industry and the university in developing and marketing a new variety. The apple’s development was financed in part by a group of Washington apple growers, who in return will have exclusive right to produce Cosmic Crisps for at least 10 years in North America starting in 2019, Weiler said. Among those preparing to plant this year is Scott McIlrath, a Naches area grower who hopes to plant trees this week. “It has a lot of potential,” McIlrath said, noting its long shelf life. In the fall of 2019, American supermarkets will have a new apple on their shelves, and the new variety will be available for export markets a year after that. The Cosmic Crisp (TM) is an extension of the existing supply, Rebecca Lyons of Washington Apple Commission explains. Colour, flavour, shelf life; these are factors making the apple distinctive, she explains. The variety, originally named WA38, was developed by the tree fruit improvement programme of Washington State University.. “The parents of Cosmic Crisp™ are Honeycrisp and Enterprise, which give the large, juicy apple a firm and crisp texture, with the flavor an appetizing mix of sweet-tart. It also has the characteristic of being naturally slow to brown when cut." During the development of the variety, various testing orchards were planted. The first commercial orchards were planted in 2017, when 626,000 trees were planted. For this year, 5.2 million Cosmic Crisp trees were ordered, and for 2019, 4.1 million orders have been received. The first commercial harvest is expected in the autumn of 2019. “Volume will be limited in its first year, but we expect to market 5.1 million cartons (40lbs/18kg) by 2021.” It’s expected export will also pick up in 2020, due to the available volume combined with interest shown in the apple by international retailers. Washington State University President Kirk Schulz shared some of the university's recent highlights (the Cosmic Crisp Apple). Schulz boasted of WSU's economic effect on the state, including its boost to the wine industry and the university's new Cosmic Crisp Apple, a product of WSU's tree fruit breeding program, which is expected to hit store shelves in 2019. Twelve million Cosmic Apple trees are expected to be planted, in what Schulz called the largest introduction of an apple, ever.